There is a mess, our economy. We need sensible solutions to the mess, not ideological strongholds. We need to pay down our (bi-partisan) debt we’ve already incurred by reducing spending and securing more revenue. It’s just common sense and instead we are choosing to be delusional. We can have it all and someone else (China) will pay for it. I simply don’t support the assertion that we can cut spending without bringing in more revenue to offset the deficit. We need to be doing both. We haven’t been doing both which is what has gotten us into this mess in the first place. We engage in activities we’re unwilling to actually pay for. Our debt has historically been driven up by war and historically society has supported war through taxation (historically a liquor tax until Prohibition). Now we rely on American credit, a practice we even nobly extended into our housing market. No one has to pay. I just can’t agree with the Republican stance to cut taxes at a time like this as well as the mentality of “let it fail”. I question the common sense of a person who still touts free market economics after what we just withstood and are continuing to try to withstand. 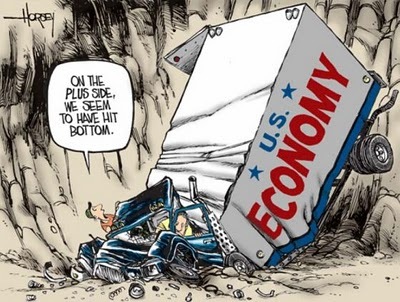 Who knows what would have happened without the stimulus packages, bailouts and housing recovery programs. If we had let it all fail, where would we be? My instinct tells me it would not be such a good place. The criticism is those programs didn’t jumpstart our economy but did anyone have any illusions that we would just snap back that quickly? The more you look into what happened the more you realize how bad things had gotten. 1 – We need to more aggressively get government spending under control. We should ask ourselves WWSJD? (What Would Steve Jobs Do?) I have no doubt in my mind every government agency and program could be made more efficient with less resources. Revamping programs like Medicare, Medicaid and Social Security is a necessity. I do believe the Democrats have shown a willingness to do this but I believe they need to be much more aggressive. They are only scratching the surface. The truth is we have all benefitted in some way. The answer can’t be that it’s solely up to the government to sort this out (otherwise we’re screwed). It can’t be that a certain percentage of the population will save the day (although they should be doing their part). We should all play a role in this. When you start asking yourself what you can do it becomes a lot more daunting but a lot more interesting. I’m not interested in Occupy Wall St. or the Tea Party or in writing a letter to my congressional representative. I like to think there is a more creative solution out there that can get people involved in turning things around, regardless of the percentage they represent. I’m going to keep looking and maybe if I can’t find what I’m looking for I’ll just have to get political and create it myself. I’ve always liked a challenge. You are currently reading Sense and Sensibility at 52 To Do.